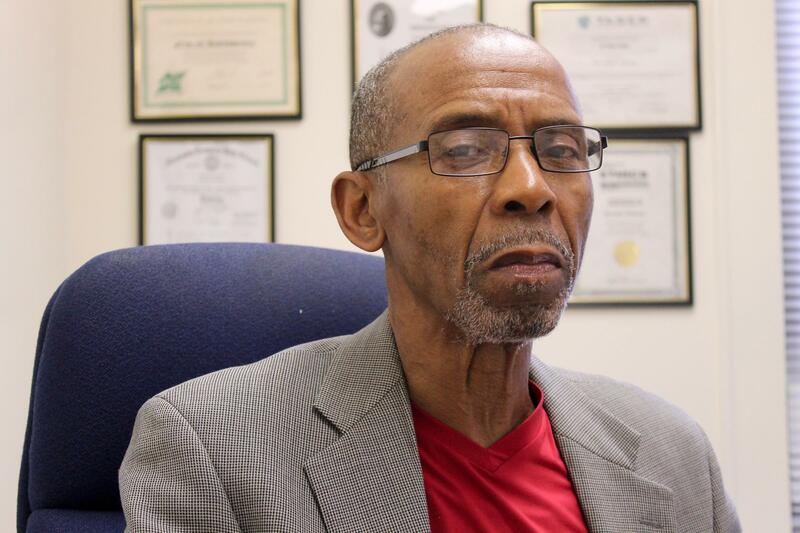 Northwoods Mayor Everett Thomas says a recently-passed bill curtailing municipal courts could prompt his city to cut staff or services. Jaquin Holmes has had his share of frustration with the way municipal courts in St. Louis County operate. During a meeting of the Ferguson Commission last year, the St. Louis resident talked about being treated harshly for what deemed to be minor traffic offenses. Holmes said he’s encountered a broken system. And he wanted the Missouri General Assembly to step up. 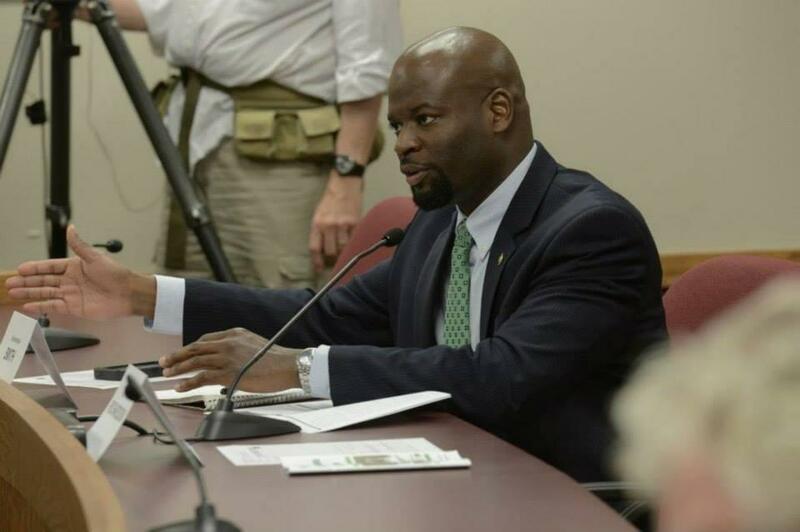 Some lawmakers believe the Missouri General Assembly answered the call from people like Holmes by passing a sweeping overhaul of the state’s municipal court system. It’s arguably the most significant piece of legislation to pass that was inspired by the unrest in Ferguson; several other proposals didn’t make it across the finish line. 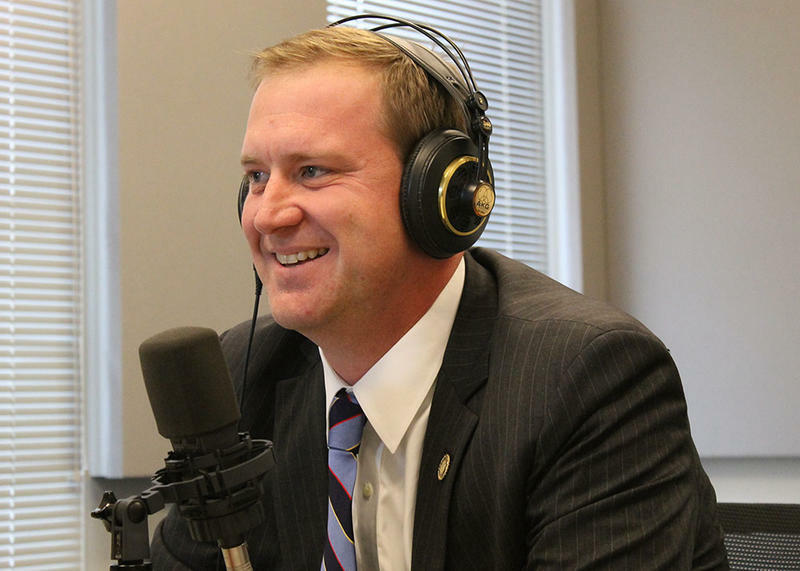 Sen. Eric Schmitt's bill limiting traffic fines made it to Gov. Jay Nixon's desk earlier this month. Sen. Eric Schmitt, a Glendale Republican who sponsored the legislation, contends his bill could alleviate long-standing tensions between law enforcement and residents. He also said the final product shows the legislature can seriously tackle a major issue effectively. “This is something that will get at the root cause, I think, of the breakdown in trust between people and their government and people and their courts – which is this ever-increasing desire by many municipalities to reach into people’s pockets with traffic tickets and fines,” Schmitt said. But while Schmitt’s bill passed with overwhelming margins and will likely receive Gov. Jay Nixon’s approval, some detractors question whether it will meet constitutional scrutiny. Others say that the measure won’t actually impact Ferguson that much and will instead hurt St. Louis County cities with predominantly black populations and elected leadership. “If we just look at the race of people in the towns it affects more, I think we can certainly make a case for discrimination just based on who was carved out of this,” said state Rep. Deb Lavender, D-Kirkwood. After Michael Brown was shot and killed, a number of prominent national media outlets spotlighted deficiencies in St. Louis County’s municipal court system. And while the courts didn’t necessarily have a direct connection to what happened between Brown and former Ferguson Police officer Darren Wilson, many felt that excessive ticketing engendered resentment within predominantly black communities. Schmitt's bill is likely the most significant bill that passed this session related to the Ferguson unrest. Other bills dealing with lethal force, body cameras and diversity training failed. Schmitt’s bill started out relatively simply, with its main provision lowering the percentage of traffic fine revenue a city can incorporate into its budget to 10 percent from 30 percent. 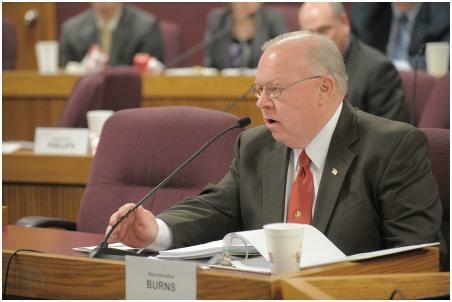 The final bill’s threshold is 12.5 percent for St. Louis County cities and 20 percent for the rest of the state, a compromise that was probably spurred on when some rural lawmakers objected to the original bill. Minimum standards for St. Louis County on budgeting, administration and policing, including a requirement for county cities to have an accredited police department patrolling the streets within six years. If a city ultimately fails to adhere to these standards, it could face disincorporation elections. 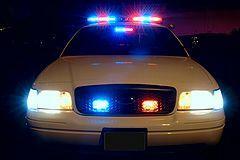 A $300 limit on municipal traffic fines. An automatic disincorporation election for cities that don’t remit excess revenue from traffic fines to county schools within a certain amount of time. Prohibiting confinement for most traffic offenses or for failing to pay a fine. A revamped definition of a city’s “revenue,” which had been a common complaint about the old version of the law. In laymen’s terms, Schmitt described the new definition “as basically any money that the city has the ability to spend. ... So it’s not dedicated resources or like pass-through money that goes to a particular fund — like the brain injury fund — that they don’t get to keep,” he added. Schmitt’s bill stands out because bills revamping the state’s use of force statutes, bolstering body cameras and implementing sensitivity training didn’t it make it to Gov. Jay Nixon’s desk. Sen. Maria Chappelle-Nadal represents Ferguson in the Missouri Senate and voted for Schmitt’s bill. While she expressed frustration that other “Ferguson-related” priorities didn’t make it, due to either disagreements or legislative bickering, she adds Schmitt’s bill could make a difference — especially since it does away with “failure to appear in court” charges for minor traffic offenses. What Chappelle-Nadal may be alluding to is how some of the bill’s biggest critics hail from north St. Louis County. 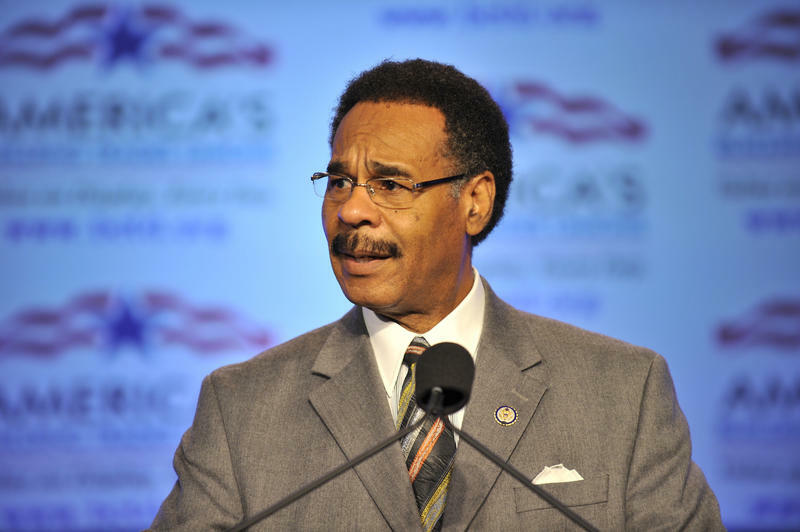 Rep. Clem Smith, D-Velda Village Hills, voted against Schmitt's bill. He contends the bill's dual revenue cap is unfair -- and possibly unconstitutional. Some — like state Rep. Clem Smith, D-Velda Village Hills — agree that municipal courts needed big changes. But he didn’t like how the revenue cap is different for St. Louis County or how the municipal standards only apply to that county. A few lawmakers, such as Lavender, feel that the dual cap may be struck down if municipalities file a lawsuit when the bill is signed. Indeed, one of the ironies of the bill is that even though it was ostensibly inspired by the protests and riots in Ferguson, it won’t actually affect the city of Ferguson that much. That’s because city officials estimate that fines and court costs encompass around 15 percent of its total revenue, which is just a couple ticks above the revised 12.5 percent cap. 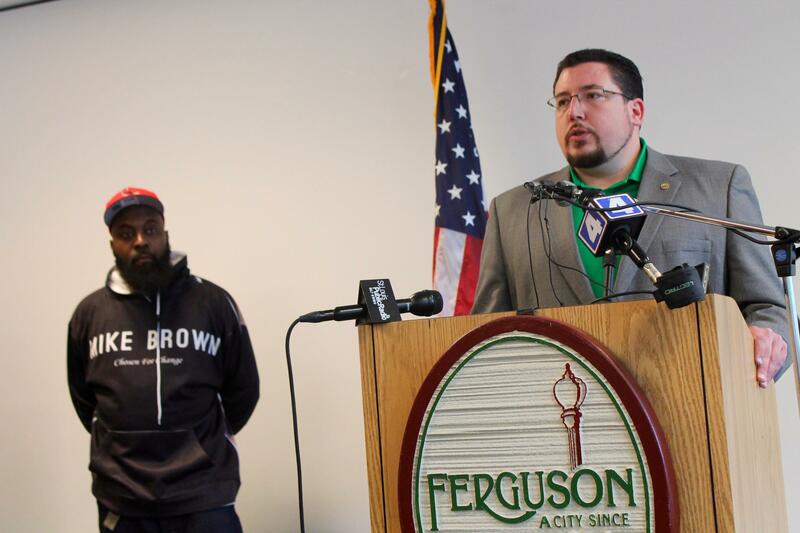 Ferguson Mayor James Knowles, right, says he doesn't expect Schmitt's bill to impact his city that much. The cities that could be most affected by the new cap are predominantly African-American municipalities in north St. Louis County. That includes such towns as Northwoods, a bedroom community where fines comprise about 25 percent of the city’s total budget. 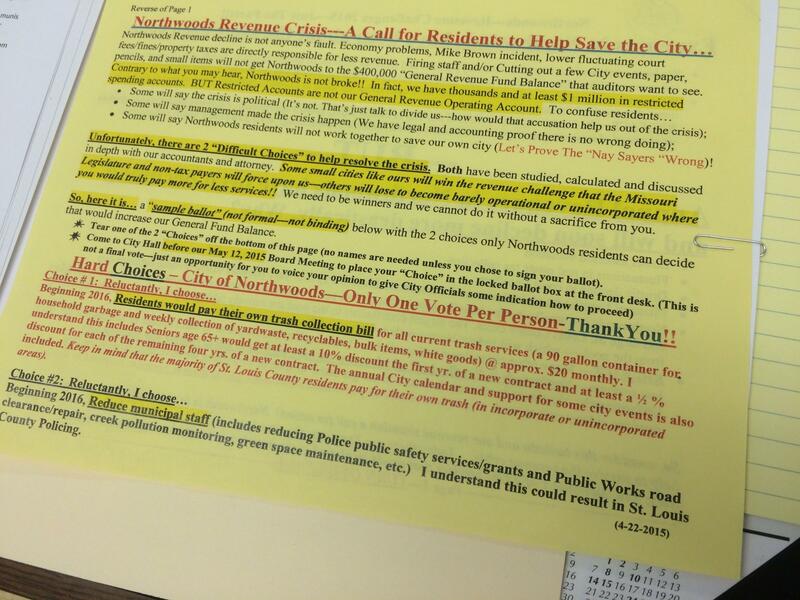 This flier was sent out to residents in Northwoods recently. It says Schmitt's bill may require the town to lay off staff or no longer provide free trash service. While Thomas contends his city could survive the lower cap, he’s not sure other cities that have black elected officials will be as lucky. St. Louis University law professor Brendan Roediger was involved in the haggling over Schmitt’s bill and likes a lot of the provisions. But he emphasized “that the elimination of black power basis actually is of concern to me. “To extent that’s the objective of some people, it’s certainly not my objective,” Roediger added. He also questioned whether percentage of revenue was a good measurement of a city’s oppressiveness. For instance, he noted that Richmond Heights and Berkeley are about the same size and receive about the same amount of fine revenue. But he said Berkeley has a higher percentage because it’s considered a less wealthy city than Richmond Heights. “It does not make Richmond Heights’ court any better,” he said. Sen. Maria Chappelle-Nadal, D-University City, voted for Schmitt's bill. But she was not happy that other Ferguson bills didn't get passed -- especially one redefining Missouri's use of force statute. "To know that it is getting stuck because of politics in the Senate is disgusting," she said. "And I think people are putting their agendas before human lives." (The Post-Dispatch also reported earlier this month about how the bill doesn't incorporate non-traffic ordinance violations into the percentage cap. That may have an impact on how county municipalities may react to Schmitt's legislation if the measure is signed into law). Schmitt too has talked with North County mayors and understands their concerns. He contends his bill is not about making cities happy — but rather helping people who feel that they haven’t been treated fairly. That, he said, includes “the predominantly African-American poor defendant that’s found themselves ensnared in the system where they’re trying to do the right thing. There are times the Missouri General Assembly can be a factory of cynicism. Simple proposals can get massaged, manipulated and altered so much that the end result satisfies no one. Some thought that that would be fate of state Sen. Eric Schmitt’s legislation lowering the percentage of fine revenue a city could have in its budget. A Republican state senator has pre-filed legislation that would lower the amount of traffic fines a city can keep. Ferguson resident Meldon Moffitt is part of a hardy group of protesters known as the Lost Voices, mostly young people willing to sleep on the street to get justice for Michael Brown’s family. Moffitt said he believes more than just Ferguson needs to change. He said, for example, he received a stiff fine in Jennings for driving on a suspended license, even though he said he had paperwork clearing up the matter. It’s part of what of what Moffitt says is as an unfair system affecting African Americans like himself. Legislation is advancing through the Missouri General Assembly to make it easier to dissolve St. Louis County’s municipalities. 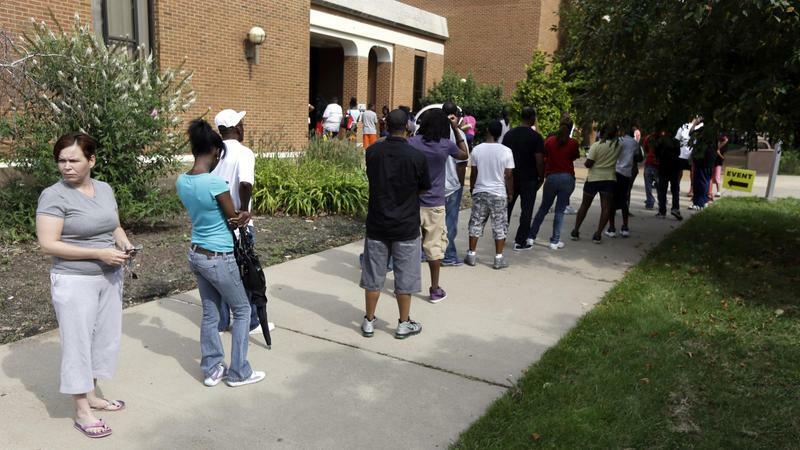 Lawmakers Produce Ideas Responding To Ferguson Unrest — But Can They Deliver? Just after the sun set on Nov. 24 — the day that then-Ferguson police officer Darren Wilson’s fate would be disclosed to the world — Missouri's Gov. Jay Nixon faced a throng of reporters at the University of Missouri-St. Louis. Appearing before cameras that would simulcast his words across the globe, the Democratic governor talked at length about how law enforcement officials were ready to respond to the grand jury’s decision. 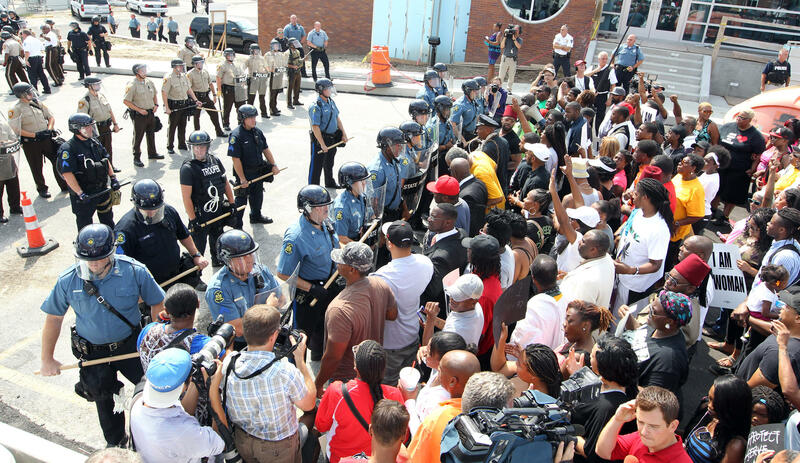 In 2013, the municipal court in Ferguson issued 32,975 arrest warrants for nonviolent offenses, mostly driving violations, according to documents filed with Missouri’s judicial department.